At the Red Bull 400 I met a woman named Elizabeth from Wasatch Adaptive Sports, a non-profit adaptive ski clinic based in Utah. What they do is absolutely amazing, they teach adaptive friends how to develop an independent and active life through sports! They have summer programs and winter programs. Iʼm from LA and we barely get any rain, let alone snow. So when Elizabeth asked me if I wanted to learn to ski…I said heck yeah! So I made a commitment to fly out and give skiing a try. Trying new things is what life is all about. Sign up for something, make the personal commitment, show up completely clueless and figure it out. In my presentations, I often tell people Relax, Just Breathe and Look Ahead. Well, it wasn’t until I was standing in the snow, with crazy rain, 722 miles away from home, did those phrases really sink in. Iʼve said them many times before. But for some reason standing in heavy boots, holding on to ski like crutches, wearing bright orange kid snow pants going on “the magic carpet” with a team of 6, did it really hit me like bricks! Traveling there, I just assumed that I wasn't going to be able to ski on my own. It wasnʼt anything negative, I just figured, well if I canʼt walk with crutches in the rain without slipping and falling, how on earth would I be able to ski on crutches. Little did I know that those phrases played a significant tool in my ability to learn how to ski standing up. I had two amazing coaches. Amelia whoʼs volunteer for the program and Peter who founded the organization in 1977! They explained first the basics, breaks, snapping my boots in, elbows out, etc. Then they had me go on to the “magic carpet.” Both of them on each side of this flat escalator that simply took you out to this tiny little itty bitty hill that has two sides. First, we started together while explaining to me how to get on and off the magic carpet skis in front...now keep your arms out and slightly turn by using your arms to guide you in the direction you want to go. But always look ahead, donʼt look back, donʼt look around, look ahead! Look ahead, relax, follow me and keep those arms out. I wonʼt lie I was a little scared. It was something completely unknown, but I was willing and I had an amazing team of support who was cheering for me, and who held me up before I thought I was going to fall. After lunch I was going down the small hill and ready for a bigger one. My two coaches kept telling me that I was catching on fast. I just wanna keep going and go fast! I got this…letʼs do a BIG mountain! My nerves set in big-time when we started to move to the bigger mountain. By now I was skiing solo...but did have my friend Brian there to help slow me down if I lost control. Getting to the top with the end in a faded sight past the trees, I knew in that moment everything I was taught a few hours before needed to be kicked into overdrive. Who knew that I had all the tools within me to accomplish this. Look ahead, stand up as straight as you can. Take a deep breathe, smile and let go! Thatʼs when I knew that this exact strategy really worked and needed to be applied to my life and so many others. My advice to you is to do just this, don’t be afraid. Look ahead. You have all the tools within you to accomplish whatever task is in front of you. Thereʼs going to be twists and turns, that’s guaranteed. But you just gotta keep going forward. Smile.....smile so big and enjoy the journey. Freak. Burden. Worthless…At times I found myself hiding in the closet just to avoid people calling me these names. If you follow me on social media, you probably know that I do a lot of races and meet a lot of great people, including some amazing kids with Spina Bifida…who I adore. I love to travel, set new goals and try new things. Some people say I’m the energizer bunny, but I really just love to stay busy and have fun. You may also know that I was born with Spina Bifida and my L5 was damaged, which led to 28 operations. I’ve woken up in ICU more times than I could count. But what you may not know is that I’ve been through some really hard times and had to overcome some major obstacles in my life - things that no one should ever have to go through. Outside of physical challenges, I grew up dealing with self-esteem issues, mostly in school. No one ever explained to me and my classmates what Spina Bifida was and that it wasn’t contagious. What hurt the most was when kids in school would point and say, “Look at that girl.” It was such a horrible feeling. Like most kids, I just was trying to fit in. But because I was different, kids would point, stare and laugh at me when I walked by. At school we had teams for different sports. Let’s just say I wasn’t the first person picked for teams and I often heard the kids say, “Misty can’t” or “She’s too slow.” No matter how thick your skin is, these comments hurt. Freak, burden, worthless, I’ve literally been called every name in the book. Trust me, I’ve heard it all. This continued even after school and at times I found myself hiding in the closet just to avoid people calling me names. 1 out of 282,000 students are physically attacked in secondary schools each month. However, my life has changed dramatically in the last few years. As a result of discovering racing and some amazing friends who support me, I’ve become self-aware and more confident. I also learned how to respond to the people who judged and bullied me. I don’t get upset anymore, but I am quick to speak up to educate people on what Spina Bifida is. I will no longer tolerate labels and want to make sure others don’t have to either. As part of my new #LIVELIFE100 movement to inspire others to overcome challenges and live life to the fullest, I teamed with the amazing photographer Steve Simpson to capture some of the names that I have been called over the years. I did this to illustrate how labels can be hurtful and inspire those that have been bullied to stay strong and #LIVELIFE100. I now ask for your help to share this photo and spread the word that bullying is not okay. Lastly, I leave you with a challenge. Say something positive to someone you love...or better yet, someone you don’t even know. Do this in person, on the phone or leave a comment on someone's Facebook. You never know what challenges that person may be struggling with internally. Even the smallest words of encouragement can go a long way to brighten their day. Have I told you how beautiful you look today? Thank you for reading my story. If you aren’t following me on social media yet, make sure to add @LilMistyDiaz on Facebook, Instagram, Snapchat and Sign Up for my Newsletter. Use the hashtag #LIVELIFE100 to inspire others with your story. Special thanks to the amazing photographer Steve Simpson for helping me share my message. The 3 Bs. Boise. Burgers. Broncos. I recently headed to Boise to share my store at a corporate event. When I landed I was once again faced with not knowing what the person picking me up looked like. Trust me this is a recurring thing that happens quite often when I travel. I love it! I was greeted by two amazing beautiful woman. If you know me well enough, I immediately asked for hugs. I truly believe giving hugs can help a person and they can tell how your personality is! I didn’t realize I had chatted with one of the women before via my Facebook Athlete page. She messaged me about running the Zion half marathon and how I inspired her to run the half after her knee replacements. We chatted late into the night, she was super sweet. Both women were a bright ray of sunshine. For this trip I was asked by Carl’s Jr. to share my story to a room full of franchise owners and investors. I love to encourage people and letting them know that anything is possible and as long as you keep moving forward, you can achieve your goals. They were such a great audience and of course I gave some hugs and took some selfie photos. After speaking I was invited to a nice dinner followed by some amazing cheesecake, my favorite! I had a few hours to spare on the trip, so I went to social media to ask if anyone would like to grab a burger. I had no idea over 14 people would show! I was so happy to meet up with those who followed my journey via social media and those who run Reebok Spartan Races. I met some amazing people on this trip and I would like to thank those who met up with me for lunch. It just so great meeting online friends in person! Saturday evening I met back up with Clayton, who had invited me to speak to the group. He is one of the most out going and humble man that I have met. He and his wife are also runners. He invited me to join his staff for a VIP tour of Boise State Bronco college football team. That was such a treat. We started out watching an inspirational video for the team, then were invited into the locker rooms and on the field. The coach even came up and wanted my photo! I must say the bling on my jersey Clayton and his wife got me attracted the coach haha. Being able to see how the coach inspires and motivates his team was such a great experience. It takes a team effort to win a game, which I can relate to. For my races, it takes a team to help me keep doing my passion. Being able to see everything first hand gave me motivation to work harder and another amazing story to tell. I would like to thank Clayton and the Carl’s Jr. team for making this trip possible and inviting me to speak. I want to say thank you to everyone who I met along this trip. I learned that there are so many people around the world that are working hard towards their goals. I love hearing their stories. Thank you Boise Idaho for your love. I can’t wait to come back! Thanks for reading my latest blog. If you aren’t following me on social media yet, make sure to add @LilMistyDiaz on Facebook, Instagram and SnapChat. Not sure what to wear? What to bring? How to tackle an obstacle? Don’t worry, I got you covered! Here are my 12 OCR Tips for Newbies. OCR's are designed to be challenging, but not impossible. If you're trying an OCR race out for the first time to see if you like it wear older shoes with terrain grips. No running shoes! You need traction. Of course, I have to recommend Reebok shoes designed specifically for OCRs will be the best option. You are going to get muddy in places you never would imagine. Underwear helps. A little. 4. Dress Light. No Cotton. The less clothing the better. Avoid clothing that will soak up water. Team outfits are highly recommended. Only race with the gear you need, but pack extra stuff to change into after the race. Extra shoes or flip flops, trash bags and extra towels to put in the car so you don't get dirt everywhere. Snacks are important! You can leave these at the bag check. Watch a few people attempt it first, then tackle it! Ask for help. OCR is about teamwork. Tip: Try to join a team if its your first OCR and always try over come your fears! The run usually supplies the shower. Some are nicer than others. You will need trash bags for dirty clothing, slippers or other shoes to wear leaving, baby wipes for the face, extra clothing to change into, cash for food and parking, towels to place over the car seats, and no there's not always soap. I've been too many OCR events where they had no soap and just 10 water hoses. You will need them for your clothes after the event. Also bring hydration for longer OCR races and zip lock everything, pack a buff to keep the dust out of your mouth and old glasses to keep out of your eye. Dry fit and compression gear won't hold water and compression is great for recovery of the joints. Also, pick up some mustard, you can grab little packets at your grocery story. When a cramp comes on, eat the mustard asap and bring a pack. Before, during and after pics are a must. Your friends will be jealous! These are a few of my tips for first timers, let me know what your tips and questions are! Just Because Someone Might Not Look Disabled, Doesn't Mean They're Not. When I moved to Los Angles, I ended up getting two parking tickets because I had forgotten to hang up my handicap plaque, go figure. A girlfriend of mine suggested that I get permanent handicap plates on my car. I shrugged it off a few times because I thought it would be too much of a hassle to get. Well a few weeks later, I ended up getting my permanent plates on my car and it wasn’t a hassle. Little did I know the hassle would come when I least expected it. A few months back an older woman was staring at me awhile I gathered my things from the inside of my car. I really didn’t understand why she kept looking at me, I was sitting inside my car so she couldn’t see my disability until I had stepped foot outside. As I gathered my things I slowly opened the door and this woman comes up to my car door and says very loudly “You do know you parked in the handicap parking spot, don’t you?” I was completely caught off guard. I said, “I sure do, thanks for letting me know.” She replied back, “Well you need a disability plaque and clearly I can see you don’t have one displayed.“ So I slowly got out of the car grabbed my crutches and stared right back at her. I said to her, “I have them displayed on the front and back of my car.” The look on her face and how big her eyes got, priceless. Not once did she apologize. It’s honestly bad enough people stare already, but to have someone loudly voice how they think I’m doing something wrong is completely none of their business and hurtful. Because she didn’t see my handicap plaque displayed in my window, she assumed I didn’t have a disability and thought it would be okay to attack me. I let the issue go and continued on with my day. Some people just assume that when I’m sitting in my car, I can’t possibly have a disability. They can’t see me from the waist down or they think, how can a person who has a disability be driving? It’s time to stop stereotyping people and realize that those who have a disability are living active wonderful independent lives. I was honestly hoping that would be the last time I had to deal with a complete stranger getting mad at me for parking in the handicap parking spot. Little did I know it would get worse a few months later. I’ll never forget it, I was having such a great day. I was in Culver City, the sun was shining and I had just gotten some fruit from the fruit stand. My dog Lola was with me and we were on our way to the bank. There was no parking anywhere accept cross the street. The one spot empty was disabled parking, so I pulled in and parked. I gathered my things began to get out, that’s when it got really ugly, really fast. Her husband was saying something as well, but I couldn’t make out what he was saying because they were both yelling at me at the same time. Lola was barking and the couple wouldn’t stop. There was a man who I will never forget. I don’t know his name, but I saw him looking at me while he was watching the couple yell and tear me down so badly. He was tall and had a ton, and I mean a ton of tattoos all over his face neck and arms. So he’s watching this unfold. He walks inside the bank. I get out of my car as am crying so badly then the couple came around to the driver’s side and without even thinking or processing what is going on, I yell back, "Is this disabled enough for you!" I only had time to get one crutch out of my car because I was so mad, but I walked fast towards them yelling and crying. The look on their faces was again priceless. They just looked me up and down and said very little to me. “Oh we didn’t see your hanging handicap plate.” My reply, “Since you’re playing parking monitor why didn’t you check my front and back of my license plate?” They said nothing else, but then ran inside the bank. I just stood there crying over the fact at all the horrible and mean things they said to me and they just walked away no apology nothing. About 5 minutes later the man with all the tattoos came outside and walked up to me as I was still crying and said I’m so sorry that happened to you. I can’t believe they said those things to you. Please don’t let what happened ruin your day and don’t stop smiling, I saw you before when you pulled up into the spot and you looked so happy. Please don’t cry, shake it off there just ignorant people. In that moment I was more reassured to not judge a book by its cover. This complete stranger with tattoos all over came up to me to let me know everything was going to be okay. Out of all that happened, what I’ve learned is a lot of people are curious and they have a lot of questions. Education is key and whenever possible, I do my best to share my story with people. Compassion and understanding is the ultimate goal when faced with a difficult situation as this. When someone is yelling at you like that, the first thing that you want to do is shut down. My suggestion when times like this happen is, stay calm, say thank you and kindly walk away especially if they’re yelling. But if you can educate them about your disability, ask them if they have any questions. You’ll be surprised what response you will get. Don’t allow this to discourage you, remember those who judge like this don’t know a thing about your or your disability. We have to good of a life to be stressing over people who jump to conclusions and assume. After all that had happened that day, I went about my day and continue to have a great day even after some crying. Let’s educate! Before heading to Hawaii to compete in the Spartan Beast, I had gotten really sick with an infection related to my Spina Bifida. I honestly didn’t know if I was going to be able to make the trip, but leaving the hospital on Monday I decided I had to do this. I still wasn’t 100% right, but Tuesday I woke up and jumped on a plane to Hawaii. I made it safe and sound, but by Wednesday, I knew my medication wasn’t working for me. I kept thinking about how badly I wanted to accomplish all 3 Spartan races in 2 days. Well, things don’t always work out as planned. Along my journey, I’ve had to learn patience and acceptance. I slept most of my Hawaii trip and had stomach issues due to the medication, along with high fevers. The doctors adjusted my meds, and the night before the first race I was finally able to pull myself together and decided it was go time. I was ready to take on the Spartan Beast! The day of the race, the weather was very hot and humid. Luckily adaptive athletes get some prime parking. Walking up to the venue was a mad house, with people on the ground searching for something, I just didn’t know what. Walking up a little closer, I noticed boxes of headbands with our numbers had been poured out all on the ground. Looking for our headbands was pretty impossible, so we decided to write our numbers on us with a sharpie. This seemed like a great idea at the time, but due to the humidity, it came right off. So we went without a number, and started as soon as possible. We started our first obstacle at 9 am. I honestly didn’t know how long it would take me to finish a Beast, but we were going to find out today. It was pretty calm at first, followed by tall grass, felt like a jungle being so short. I literally fought off grass, and sticks. Cold water came in no time, followed by the cargo net up hill, and then up ahead was a huge mountain, with an emphasis on HUGE. It looked like tiny ants climbing the mountain. Slowly but surely we were making our way to the top. Mentally, I felt great. Physically, I prayed really hard that I could handle it. There’s always that point during a race, where you can turn around, or keep going. I came upon that faster than I thought. Making that quick choice to keep going, before I allowed my mind to convince me to turn around. Onward! While going up the hill, many told us as they were passing us down on the other side, "good luck, it’s very rough and slippery." They didn’t lie. The only way to climb to the top was to dig my hands into the mud, then grab on to whatever looked stable (shrubs, trees, plants, tree roots) whatever I could find. Little by little, going up. Anytime I used my crutches, they would get swallowed up so deep into the mud. Most of the time I had to give my runner my crutches so I could bear crawl it. Thankfully before walking at a later age, I was a pro at crawling. By the time we got to the top, I was exhausted and had scrapes and scratches all over my hands. Oh but wait, we still need to go back down. Going back down was totally unsafe. Now were using those bushes, trees, and roots to stop us from rolling down the hill. As tiny as I am and light, it would not be a perfect way to be taken out. Grabbing on to anything to stop my fall. My eyesight must always be on point when I race. Most of the time you will notice my head down, making sure I don’t fall. Despite wearing leg brace, the fall would be bad. Placing my crutches on something unsafe, could take me out in seconds... and Biggie Smalls would be down for the count. I was relieved when I finally made it down the hill. After that it was smooth sailing through a few obstacles, a spear toss, some rig action, a rope climb and a sandbag carry. I was able to finish in about 9 hours, which was a really good time for my turtle elite status. A big thank you to my runner Chad, who had amazing patience and communication. Getting to the top of that mountain was one of the best feelings. I’m truly blessed to have the support of some amazing people. We did about 13-14 miles; everyone’s GPS came out different. Let’s give a big clap to Norm for his assistance in building this year’s Hawaii course. If you’re not familiar with Norm, he builds the hardest Spartan courses #EFFNORM. I truly want to say thank you to my sponsors from Bakersfield, Fit Aid and my amazing followers for their endless support and love. I was a little disappointed by the lack of photographers on the course this year. Also, some things felt a little less organized from last year, especially for competitors coming in later. But despite a few event hiccups and being sick, I had an awesome time. The beautiful sights, the amazing people, the sense of accomplishment all made it worthwhile. My advice. Make the best of it. Things didn’t go as planned from the start of my trip, but I made the best of it and was able to accomplish 1 race out of 3. I must humble myself and remind myself, just years ago I was laying in a hospital coming out of a 12 + hour operation not being able to move. Be thankful Misty. We all have choices, choice to be stronger, mentally fit, or tougher. Or we can allow this world to shape our thinking, and shift our focus. Don’t allow your willingness to strive to be better, be changed by the outside noise around us. See you soon Hawaii. Thank you to Spartan Race for another great race! I remember telling myself in 2014, I'm going to Canada, I'm going to travel to Canada to race, and meet amazing people! Fast forward a year, I'm on a flight to Canada. Meeting friends who have been following me ON social media. I've seen a few photos of these friends, but nothing more then a profile picture. I had arranged my stay with two families who had kids with Spina Bifida. Upon arriving at the airport, I look around and see a little girl holding balloons with a sign saying "Welcome Misty!" I made it to Canada and I had no idea that my life was about to change for the better. I had some how convinced the two mothers, to run a Spartan race with me. One mother denied me twice, but eventually I convinced her it would be fun! Being completely uncomfortable is fun right? Later did I know she would be thanking me from the bottom of her heart to changing her life. I had the most amazing privilege to run for three amazing little girls with Spina Bifida. Emily a very outgoing and non-stop chatter box calling me "Misty Diaz”. Audrey quite the sassy girl, always wanting to wear a princess dress. Three beautiful girls all being connected for the first time. Social media has allowed me to connect so many friends together for the first time, unbelievable. My mission to finish both Spartan races became ever so pressing. All 3 families would take the time to come watch me race and participate. I had no idea how the weather would be during the race, but when I got word that there were heat warning advisories, I knew I would be in for a hard race. I geared up with my regular routine before and during a Spartan race. Showed up on time introduced myself to some directors of Spartan Canada, they were so welcoming and helpful. The first day about 9:30am I met my team of 4 meeting for the first time. The first thing we did after crossing the start line, can you guess? That's right, went up a huge hill. Damn you Spartan. Hill, after hill, after hill. The course was on Brimstone ski resort, which was a grassy terrain. There were some groomed trails, a lot of mud. Some gravel, pretty tame. Just a lot of hills. The hills were as steep as you can expect them to be at a ski resort. The first day my team and I did the sprint. Some obstacles were walking on a beam, ringing a bell at the end, monkey bars which were very slippery, 12ft walls, 15 ft walls, mud pits with tons of water, under cargo nets, slippery wall climbs, rope climbs, and a lot and I mean a lot of mud. There were times where it was just so hot, I would drench myself under these water towers they had on the hills, and run my entire body under. I wore a cool towel and wet it at every station. When the negative thoughts came to my mind, which was quite often, I was reminded of how I had two amazing kids with SB waiting for me at the finish line. At some points coming down the hill's completely exhausted, we could see all of our cheerleaders team cheering for us. I knew once I heard those little girls saying "Go Misty Go”, we needed to keep going. My mission has changed over time the more I race. At first I just wanted to feel better, to find something worth waking up to on a daily. The more that I have raced, I found my purpose. Running for those who have Spina Bifida. Going into the homes of these kids and spending one on one time with them, recharged my battery and gave me more direction on staying true to my mission. Doing my best and telling others my story. Seeing those kids waiting for me at the finish line with there families made my heart so happy. Another Spartan race completed! Couldn't of done it without my team. Oh but wait, we still have another race the next day! The next day Liz and I ran together, she has an amazing daughter Emily who has Spina Bifida. This firecracker enters kid races in her walker and her hot pink crutches! They welcomed me into there home for a sleep over and let me tell you, this future Spartan already has her own medal rack...I love it!!!! Liz was my 1 and only runner for Sunday. 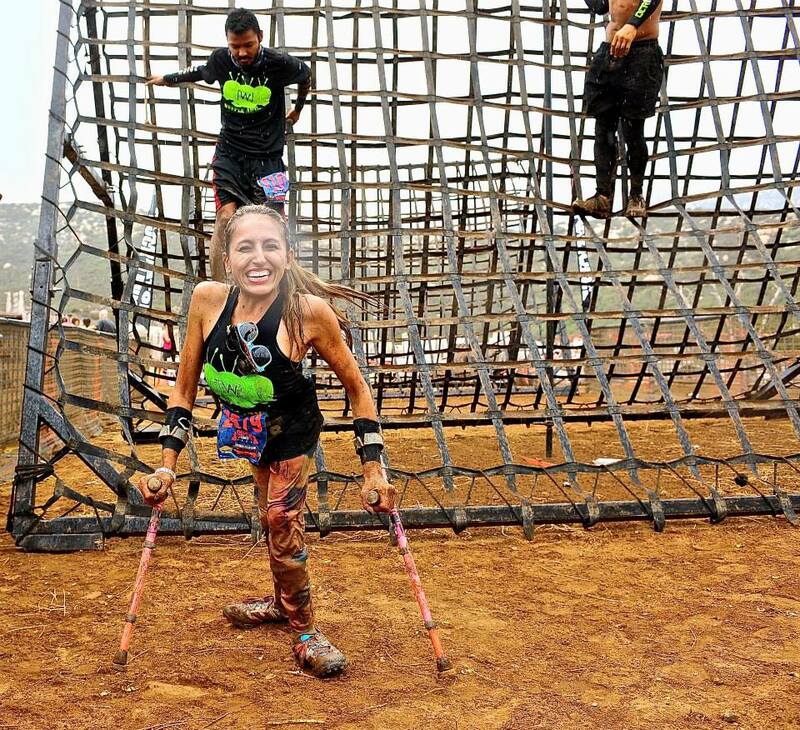 This was her first Spartan race. Right off the bat I swear it felt hotter than the day before. Mile one I told Liz, I feel like I've been on this course ha. We went though all the same obstacles until about mile 5. Then we were faced with the largest mud pit I had ever seen. Who knew yards of mud pits existed deep into the ski resort. Oh and there was barbwire along the sides to keep you on the course. We attempted the mud pit and immediately knew it wasn't going to work. You would think the mud pit was one level, until you stepped into it got some speed and boom it dropped off shoulders deep. My crutches kept getting stuck. The only way around this was going on the sides. Thankfully I had a team I met up with who helped me stay on the outer edges. I can't tell you how many times I lost my crutches, we would stop and dig for them. Liz lost her shoes, she ended up running barefoot though the mud until we finished it. This obstacle took quite awhile. We laughed a lot, I think at that point we might have have been delirious due to the heat and being on the course for 6+ hours. The rope climb got me this time, I made it to the top so completely exhausted, but couldn't hit the bell. I had exhausted all my upper body by the second day. I learned what I needed to do next time and moved on. By the time we got out of the mud pits, rain started then thunder. I started freaking out running and skipping a few obstacles, I had to...I'm using medal crutches. Lighting and medal don't go together. hahaha. Liz and I had such a great time, we crossed the finish line with rain and lighting, while her family waited for us under the slippery wall, Emily was cheering for us so loudly!!! I knew all the suffering hahah and having to dig for my crutches, all the heat, all the mustard packets I had ate paid off. All for hugs and smiles waiting for us at the finish line, I knew my mission was complete. Showing these kids and parents anything is possible, you just might just have to do things a little differently, and that's okay. I learned that I am stronger then I thought, that life is better being lived by example for others to follow. Canada you were amazing. Thank you to the Spartan staff, thank you to all those who ran with me, thank you to everyone who cheered for me. Truly, thank you. It's always a privilege and blessing to be invited to Dan "Nitro" Clark's Gladiator Rock N Run 5K in Orange County California. In case you were wondering...YES that is THE Nitro from American Gladiators! Immediately arriving on site, I noted the amount of people having fun, laughing, and smiling. The grass area had tons of sponsored booths, food trucks and most importantly...the beer booth. Everyone was muddy, wet and laughing a lot. Thats what I love to see. This year the selection of food, merchandise and sponsored booths, gave athletes quite the variety to enjoy. Boy, do we love choices! One of the biggest things I love and I mean absolutely LOVE...is how Dan interacts with everyone. Not just some people, but everyone that is running. He's at the start of every wave, getting everyone pumped up before take off. Not only that but he takes notice of the biggest team, which of course was the Weeple Army! The course had tons of rocks and dirt. The first thing we accomplished was a hill, then cargo nets. I love the height of the cargo net, it allows those who are afraid of heights to conquer their fear. Up next there was a big wall, called Walls of Fame. Up and over and your done. Again perfect height. The mud pit was kinda long and my friend lost his shoes during one point of the mud walk. "Buddha's Burden" which included picking up a sand bag and carrying it around a giant Buddha and dropping it back off. I honestly think they could have made it harder with a longer a carry or adding burpees at the end. I did the walk with sand bag carry with no hands hahah. I carried it on my shoulder and walked just fine. "Cinder Block Burppes" was ruff. Who wants to add a cinder block up and over then back down for a burppe? Hahahaha exactly. But we did it. "Rope climb" I loved this challenge. There were ropes with and without knots. I'm glad that was an option, some athletes don't need knots and some do. We love choices. Again, I saw some great teamwork. Cheering on others and some holding the rope steady for others. "Polar plunge" was needed at the start and at the end! Polar was just a pool of ice cold water. Because of how hot it was, I wanted to swim in it a little longer hahah. Perfect cool down right before finishing. "Morning Wood" made you work together as a team, carrying a really big heavy log around. I really enjoy team challenges. Lets get everyone on the same level and work together. "Mud Madness" challenge was a mad crawl, I wasn't a fan due to the lack of water. But lets take into consideration the drought we have going on here in California. "Tired out" was an accurate name for a challenge. Grab a tire. Put it over your neck. Do lunges. Adding weight to lunges, in hot weather can add for a hard work out. People were tired by the time they reached this obstacle, but from this obstacle you could see the finish line, so we pushed through. "The Beast" was right at the end of the race. Let me tell you going up a muddy wall at 90% degree, grabbing on to a rope that is super muddy, it's really hard. I stood back to watch people attempt this challenge. Let me tell you its always a good laugh because its just a really hard challenge. You see so many giving it there all. Not only that, but the team work that goes into it was super inspirational. At the top of the wall, there was a line of people helping others up and over. That's so awesome to see complete strangers helping one another. By the time you hit this obstacle, you're so tired! For me, I don't use my legs, I use all upper body. I didn't need any help. I was so proud to see so many accomplishing this.